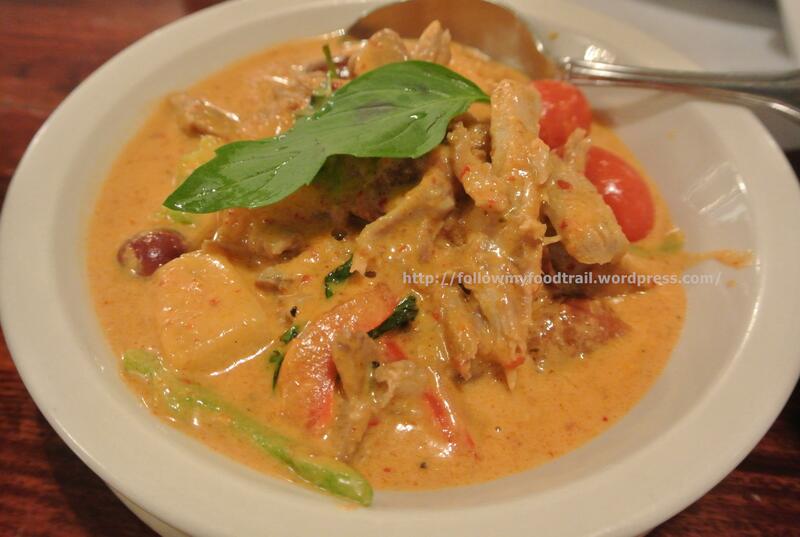 Lotus of Siam was demanded by J as a must try. He said the food is so good there I will go back at least twice. He also said I should aim to order six dishes between hubby and I (that’s what him and his buddy did and I think they got escorted out in a wheelbarrow). Haha well, with no absolute way to store or cook leftovers, we have to be conservative! Anyway, I was happy that they serve the full menu at lunch so I didn’t have to wait to get in at dinner because they no longer take reservations. During lunch there is a decent but Westernized buffet lunch at a low price of $10.95. However, that’s not what we came here for! 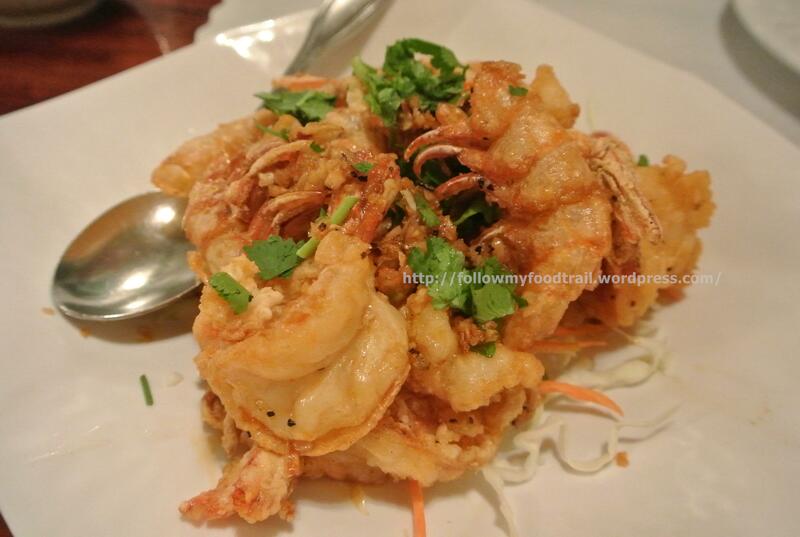 If you like garlic and prawns, this is a dish you MUST try or you will regret it. I could not believe how insanely delicious this was. 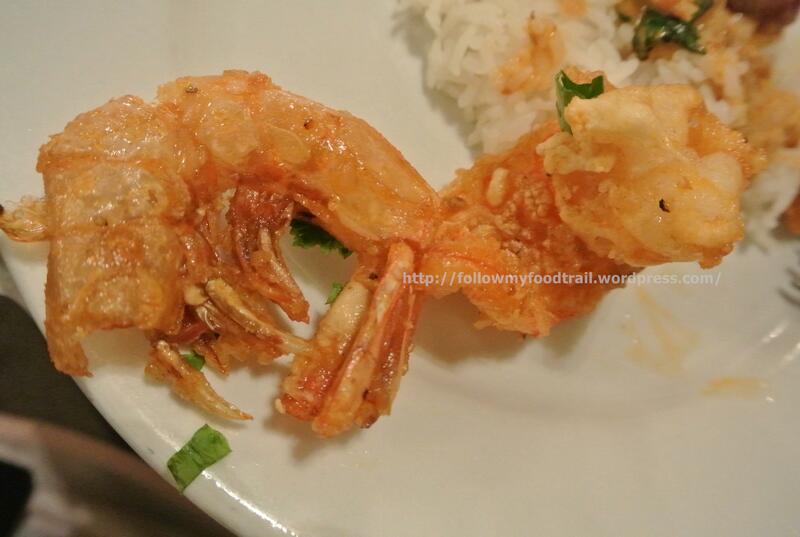 Six huge, juicy, succulent prawns with shells detached but still attached at the tail, then deep fried, and then cooked in their secret blend of spices and sauces. The shells were crispy and brittle… so good to eat. My God. I still think about this dish to this day and it’s been over two months. Again, you really have to love garlic because your mouth will smell like it for the rest of the day. There’s enough garlic in here to weed off an entire colony of vampires. I seriously almost decided to cancel my lunch plans the next day just to go back and eat this but nope… I had way too many places I wanted to try! I did consider take out and bring it on the plane but it won’t taste the same. Anyways, the next time I’m back at this restaurant hubby and I will be getting our own plates! I decided we had to try a curry and picked one with my favorite meat in it. This is a mild curry with hints of sweetness from the pineapple. Although the curry is on the thinner side (as it’s supposed to be), the abundance of ingredients completely fills the bowl! There’s more meat than anything else in here – unlike most other places where it’s mostly vegetables with a few pieces of meat. I know hubby loves his mussels, and as we were looking for one more dish to try I thought this was a good choice b/c we didn’t want any leftovers. 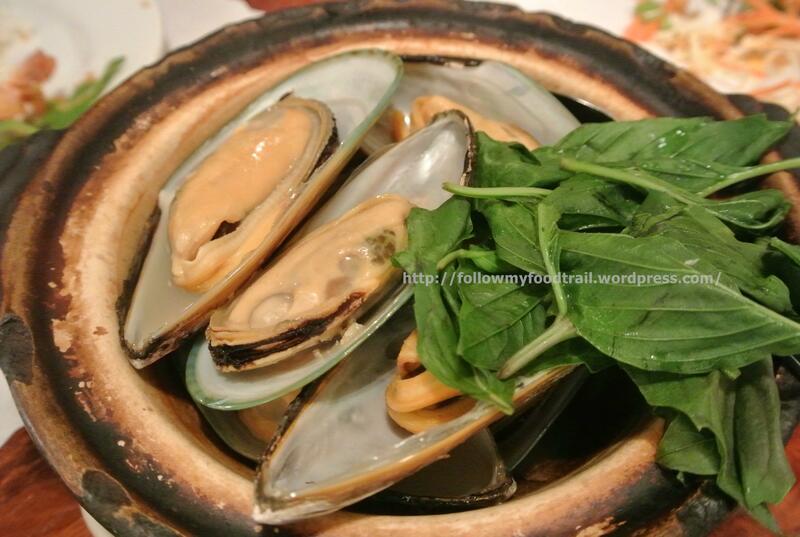 The mussels were plump, meaty and very aromatic from the fresh Thai basil. This was served with a chili dipping sauce (not pictured) and it perfectly complemented the mussels. Perhaps I look like I could eat less dessert, but I found it strange that our server didn’t ask if we needed anything else before bringing us our bill. As a result, when I actually asked for dessert, he had to go change the bill. 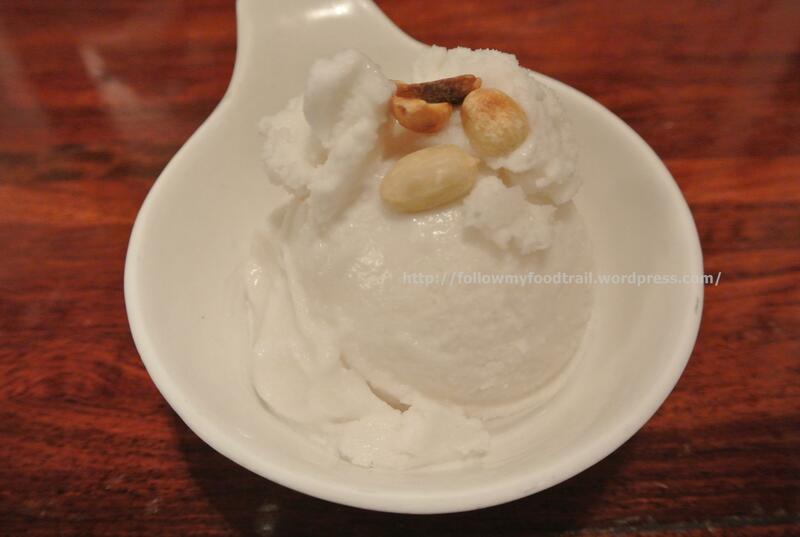 Well, I wanted something sweet to cleanse the heavy spices from my palate and they don’t actually have much choices for dessert, but this ice cream was perfect with intense coconut flavors and just a hint of sweetness. It also didn’t taste very artificial (which is good). When our server asked us how we found out about the restaurant, I told him that my friend said it was a must try. He didn’t seem surprised nor did he have much of a reaction… I guess they know they are that famous and popular huh? I really did like the food here and would’ve loved to try more, but we were modestly full from the above dishes and I’m still wondering how J and his friend ate double of what we did. In terms of pricing, I thought prices are quite low to average except for the prawn dish which was a tad expensive. However, it was definitely worth it! This is definitely a hidden gem off the strip and I know I will always visit this restaurant every time I’m in Vegas!